Doctor Who: Revisiting THE DALEKS’ MASTER PLAN | Warped Factor - Words in the Key of Geek. Dr. Moo finds his place of perfection. How does one even begin to write a review of the second-longest serial in the entire history of Doctor Who? Spanning a whopping twelve episodes and clocking in at over five hours, if you’re going to take this “Everything And The Kitchen Sink” approach then you need to make it all work or else you risk falling flat. 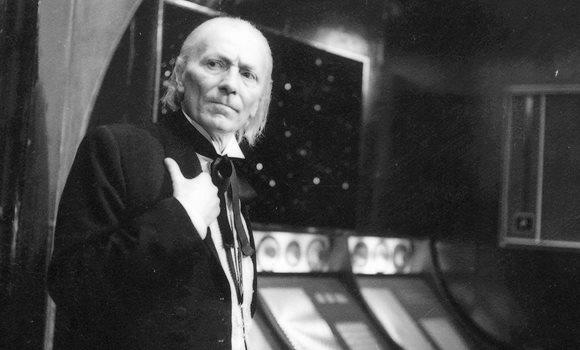 Similarly for the frankly ridiculous length to be justified you need to have a story that deserves to have such a treatment – 1986’s The Trial Of A Time Lord, while underrated, serves as proof that bigger is not always better. Thankfully what we have with The Daleks' Master Plan is actually a decent story in its own right. One that overcomes the traps it could possibly have fallen into in lesser hands than co-writers Terry Nation and Dennis Spooner, as well as director Douglas Camfield, to become not just one of the greatest Dalek stories of all time (in a welcome return to form for them) but one of the overall greatest Doctor Who serials of all time ever. I kid you not when I say that I genuinely prefer this to the likes of Genesis, Pyramids, Blink and even Heaven Sent. The Daleks’ Master Plan has something that few Doctor Who stories have: Scale, ambition, no inhibitions and TONNES of variety. Sure there are other Doctor Who stories that have these things, look no further than those other four I just mentioned, but none have these things in such abundance as this one – this story encompasses the perilous jungles of Kembel, a conglomeration of representatives from a variety of star systems plotting to conquer the universe, the return of the Monk, a runaround in Ancient Egypt, a spaceship chase across the galaxy, the prison planet Desperus, the bubbling swamps of Mira, and that’s just the locations! All of these are well realised too. The production crew had a lot of demands made of them by the Nation/Spooner scripts and they did such a beautiful job with them that you can excuse the odd poor effect, like teleportation via jumping on a trampoline and a handful of invisible monsters. So the story boasts a HUGE variety of settings then as the Doctor and his constantly changing crew of companions flee the Daleks. But what about the Daleks themselves? Are they used well? Yes they most definitely are! 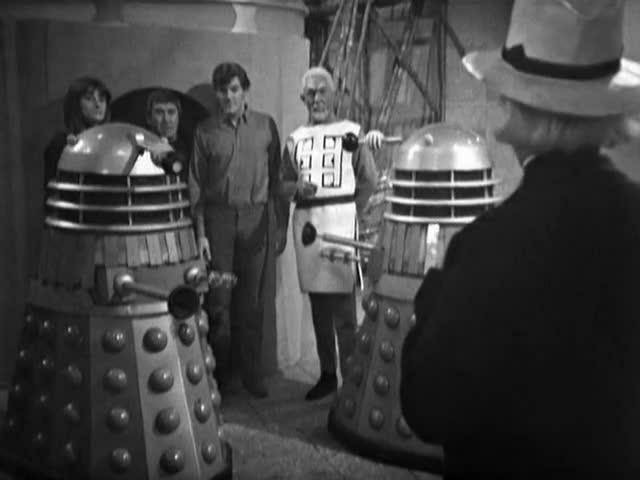 These are the Daleks at their most ruthless, sparing nobody from their exterminating blasters of doom. They’ve even got flamethrowers now (an idea lifted straight out of the Peter Cushing movies) and the first cliffhanger when they surround the TARDIS trying to find a way in is genuinely scary, as are a few other moments. Seeing them mow down a group of Ancient Egyptians like a bowling ball knocking down the pins is a horrifying sight and when they take Steven and Sara captive it’s frightening to watch the Doctor forced to hand over the Taranium Core that they’ve been chasing him for that will allow them to complete their Time Destructor if he doesn’t think of something very clever very fast. Not even their allies are safe when they blow up the ship with them all inside it, discarding them the moment their usefulness has come to an end. Not even the true villain of the piece, Mavic Chen, is safe from extermination. Essentially the story restores them to their former glory as universe conquerers. These are cunning, scheming tacticians who will stop at nothing to destroy anything and everything that doesn’t bow to their vision of uniform ideology. And did I mention Mavic Chen? On paper Chen is just a typical egotist manic with a god complex like you could see in any movie you care to mention, but in practise Kevin Stoney is subtle in his performance with a well-spoken malevolent manner and a pen-grip that you have to see to believe. This treacherous Guardian Of The Solar System has entered an alliance with the Daleks, but despite this he can’t get them to bow to his will. All the way along he is lead to believe that they are merely pawns in his game of universal chess but in truth they are using him, despite how powerful his delusions of grandeur may make him feel. Come the story’s end he’s genuinely gone mad with power, believing even after all his other allies are blown to bits by the Daleks that he’s invincible to their attacks and learning the hard way that he isn’t. It’s hard to feel sorry for him though, his death even drawing out a cheer from the audience watching at home. Stoney is the best guest star ever in Doctor Who, with only the guy who played Tobias Vaughn in The Invasion coming close. 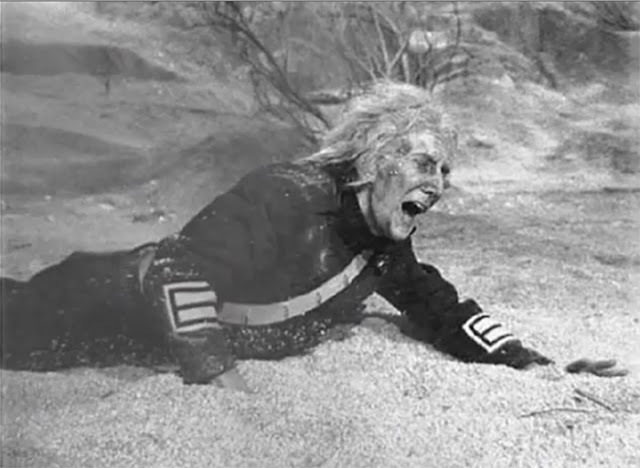 Speaking of best performances this is where William Hartnell gives his. 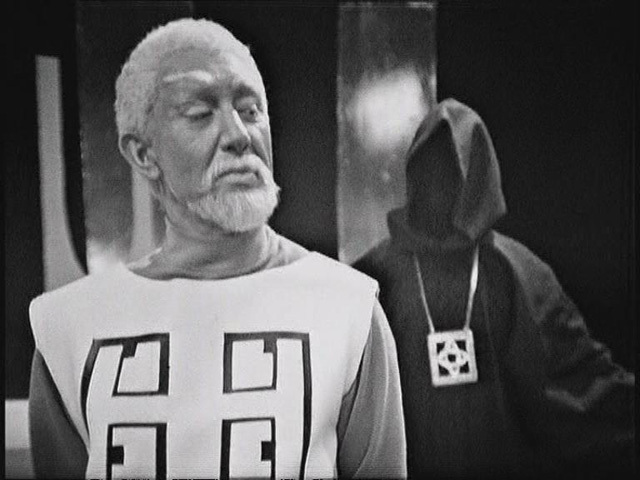 Everything that defines the original Doctor is on display here: His rebellious spirit is plain for all to see when he is reunited with the Monk, we have some of his signature monologuing, pure genius cleverness, creativity, outwitting his foes and (on more than one occasion) complete and utter hopelessness. Not many actors can do all of these things in the same series, but Hartnell does all of these things in the same serial. He even, uncharacteristically, carries on despite sounding poorly on a few occasions. While it’s Kevin Stoney you remember afterwards, this is very much Hartnell’s show. Peter Butterworth’s great to see here by the way, adding some welcome light relief as the Monk and proving essential to the story when the Doctor once again nicks a component of his TARDIS. Which brings me to the remaining characters: The companions. The Doctor has four of them here but never all at the same time. We start off with Steven and newcomer Katarina but only one of these will last for long. 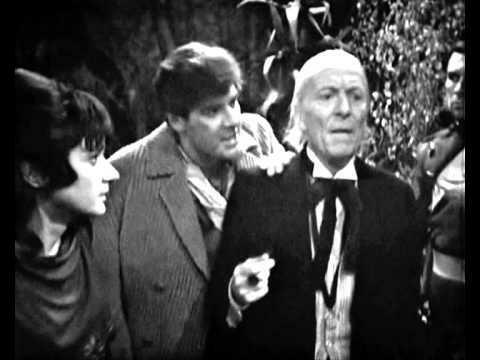 Peter Purves continues to pursue Steven’s humourless deadly serious approach while butting heads with the Doctor, despite an obvious deep mutual friendship between the two. Adrienne Hill’s not given much decent material with Katarina because the character’s frankly pathetic in every possible way, but she does the best she can with what she has to work with. In episodes four she gets sucked out of a spaceship airlock (the writers go for the heroic sacrifice angle) and this is stunning. Something like this had never happened before and must have knocked audiences down in 1965! She’s not the only one to go either – while neither are companions in the conventional sense, Bret Vyon and Sara Kingdom both travel with the Doctor during this story in what is effectively a companion role for several episodes before they both receive brutal deaths. Bret, a prototype Brigadier character played by the very same Nick Courtney, gets shot down by his sister, and later Sara, a tough “shoot first ask questions later” type, gets it worse than anyone else with possibly the most brutal death in the show’s history. She is aged to death while Steven can only watch in horror from the safety of the TARDIS. The Doctor barely makes it out of that same scenario unscathed, and only because of his alien biology granting him a longer lifetime than Sara. It’s a shame that we didn’t get more time with her travelling with the Doctor and Steven because the trio show all the hallmarks of a great TARDIS team, and Jean Marsh is a wonderful casting choice who plays the role magnificently. The perfect end to the perfect story. The Daleks’ Master Plan is a true achievement, and for Doctor Who to just make it one of several stories in a season is a testament to the show’s ever-present ambition. This story is not one for the faint of heart but it’s well worth viewing and something that every fan should watch at least once in their life.